In a small quaint fictional town of Chipping Cleghorn, a newspaper advertisement turns all heads towards the house of Little Paddocks on Friday October 29th at 6:30 PM. A murder is about to happen on that day, that place, that time. Everyone thinks it is a prank. But they cannot contain their curiosity. Around a dozen people assemble at Little Paddocks by 6:30 PM and all are almost ready to laugh at the prank, when suddenly, BOOM!!! The lights go out. Three shots fired, the second shot breezes past the ear of the lady of the house, Letitia Blacklock and with the third shot, the shooter shoots himself, or so it appears to be. The police arrive and what seems to be a work of a psychopath and a robberer, leads them to the conclusion of suicide or accidental death.The inspector in-charge, Craddock is not satisfied. When they are about to close the case, the adorable, old Miss Marple steps in with her knitty sweaters and inquisitive mind. She offers some valuable inputs to the police and the chief inspector orders Craddock to work with Miss Marple. The problem is that the murder happens in the dark just after a dazzling flash of a torch light . So the conclusions have to be deduced from only what the witnesses of the crime could hear or smell. Who was standing where at that point of time? Who was in the hallway? Who went to get the wine? Who opened the door? Who will benefit from the death of Letitia Blacklock. have the sharp,shrewd Hercule Poirot in this book. Instead, whom we have is an old lady who loves to have tea and lots of gossip with her neighbours. She loves chatting with them, observes things around her keenly, picks up all the subtle clues- like the place where the vase is kept, the reason why the fire was not burning, and why certain photographs were missing in the photo album. The story goes on a very gripping ride, stops momentarily at each character involved, and when it stops, you suspect that particular character might be the murderer. The motive is there with everyone, yet no one . 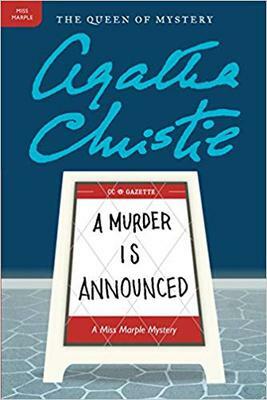 As the mystery unfolds, two more murders happen, which has both the inspector and Miss Marple on their wits end and makes them cut to the chase. The next murder can happen anytime, any moment. It's a wonderful book, but definitely not a breezy read . Agatha Christie's books make you read and reread the pages, just in case you miss a small clue . You would want to think that you found out who the murderer is before Miss Marple or Poirot reveal it to you. The most unlikely person is usually the culprit. I have always loved Agatha Christie's books, and watched most of the episodes of David Suchet as Poirot - he is my favourite Poirot. I did not like the movie ' The murder on the Orient Express', despite Johnny Depp being in the cast. If you are an Agatha Christie fan, do watch David Suchet. Back to the point, this is the first book of Miss Marple for me, and boy, I enjoyed it thoroughly. A definite thumbs up ! !